Three years ago, an incident at the foot of a staircase was called a "Chanukah miracle" by local residents. David Wilder, said he heard the gunshot that ended what could have been a much bloodier terrorist attack. "I was speaking to a group downstairs in Beit Hadassah," Wilder stated at the time. "People were asking me about terrorists attacks in Hebron and as I was talking to them, I heard a gunshot. I looked out the window facing the street and saw a couple of people, like in the movies, with their guns out." That incident resulted in restrictions being placed on use of the "Madregot HaTikva" stairs next to the Cordoba elementary school. Local residents, students and teachers are free to access them. The attack occurred on December 9, 2015 when terrorist jumped on a soldier at the bottom of the stairs, stabbing him repeatedly. The terrorist was neutralized after unarmed civilian Yitzchak Struk tackled him, suffering a broken hand in the process. On December 2, 2018, Israel's Supreme Court upheld the restrictions by reaffirming the authority of the Israel Defense Force to make decisions in the unusual security situation of Hebron's H2 area. Struk, the son of former Member of Knesset Orit Struk, was later awarded a special recognition from the Israel Defense Forces for his stopping the terrorist who was shortly afterwards shot by a security guard. The attack occurred two days after the murder of local Hebron gardener Genadi Kaufman z"l, and in the midst of a rash of stabbing attacks in Hebron and throughout the country, dubbed the "Stabbing Intifada." The call for allowing anyone to use the stairs unrestricted was issued by Palestinian Authority resident Issa Amro who filed a petition in Israel's Supreme Justice with the help of the Association of Civil Rights in Israel. Amro is the head of Youth Against Settlements, a group that advocates the removal of all Jews from Hebron and has often clashed with Israeli security personnel and residents. The group's headquarters is located nearby and Amro is free to use the staircase. In the past he has been charged by the police with attacking soldiers and civilians, and incitement. Cordoba, an elementary school named after the Islamic Caliphate of Cordoba, Spain is located in the H2 section of Hebron, across the street from Beit Hadassah on Shuhada Street / King David Street, within the 20% of the city under Israeli jurisdiction. Of the 20%, Jewish civilians are only allowed to venture through the Jewish neighborhoods. The 80% of the city under Palestinian Authority jurisdiction is completely off limits to Jews. The largest PA city in Judea and Samaria, it is the heart of the PA's economy and contains a thriving business sector with several large shopping malls, hospitals, and a football stadium. 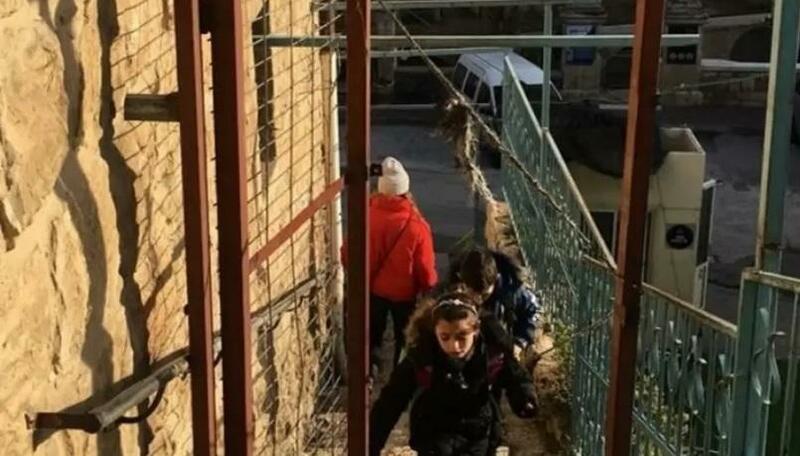 Following the upholding of restrictions to the staircase, Wilder stated, "being that the stairs are a few meters away from the Beit Hadassah playground, museum and apartments, any terrorist managing to cross the street would be a murderous threat to Hebron's children, residents and visitors." Supreme Court Justice Yitzhak Amit wrote, "the security and civil reality in Hebron is very complex, and the level of friction and complexity of the population creates scenarios that appear to be almost unfounded in other contexts." He added that "the weight of the security interest prevails over the specific damage to the petitioner." There is a second entrance to the school as well as access from the stairs. A July 26, 2007 article in the Washington Post reported that TIPH - The Temporary International Presence in Hebron financed the renovation of a pathway at the top of the staircase. TIPH regularly escorts students to the school. In 1980, the area was the site of a terrorist attack that killed six Israelis. Hebron is home to the Tomb of Machpela, venerated at the burial site of the Biblical Matriarchs and Patriarchs. It receives approximately 700,000 visitors every year. The city was divided in 1997 with the Palestinian Authority being given full control of area of the city.